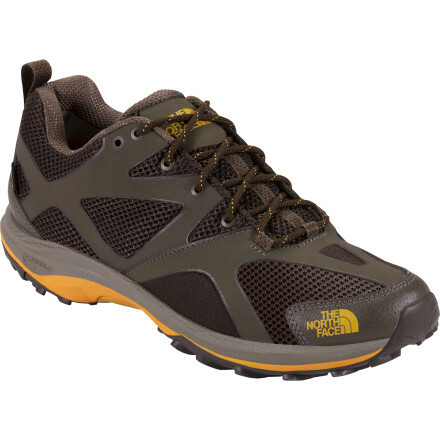 For speed hikes or lightweight, weekend backpacking trips, lace up The North Face Hedgehog Guide GTX Hiking Shoes for men. 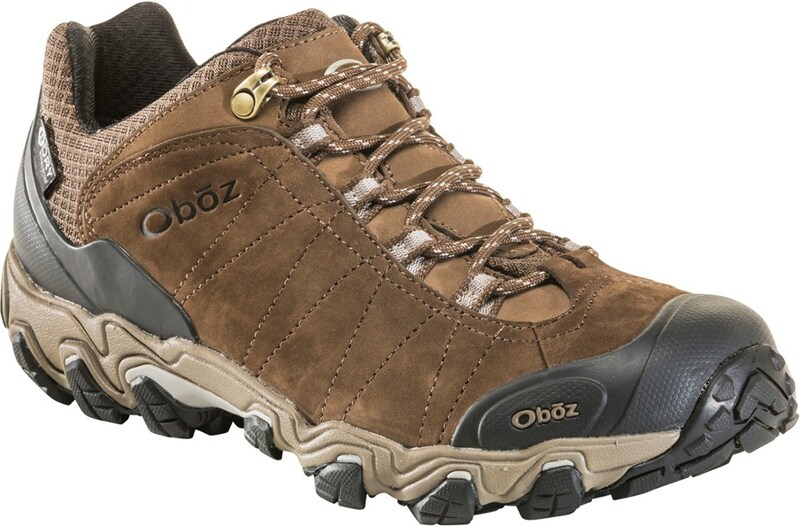 These tough hiking shoes feature a breathable mesh upper with a durable, PU-coated leather toe cap and a waterproof, breathable Gore-Tex membrane. A seamless, welded, synthetic leather forefoot prevents blisters and helps to regulate temperature inside the shoe, and the gusseted tongue fends off dirt and gravel debris. The TPU shank provides lightweight support and the TPU Snake Plate delivers superb forefoot protection when you're trekking over rugged terrain. Cradle Guide technology in the midsole naturally absorbs impact, stabilizes the foot and promotes a biomechanically correct stride to achieve the perfect balance of stability, cushioning and comfort. Underfoot, lightweight Grippy Vibram rubber provides excellent traction and grip over uneven, muddy or slippery trail conditions without weighing you down. From the summit ridge to the urban forested park, you'll love the lightweight comfort of the Hedgehog Guide GTX Hiking Shoes. When you only have a little time and a lot of miles to cover, lace up The North Face Men's Hedgehog Guide GTX Hiking Shoe. Weighing in at under a pound each, the Hedgehog boasts a Gore-Tex membrane for guaranteed waterproof protection and an EVA Cradle Guided midsole for cushioning and an enhanced natural stride. 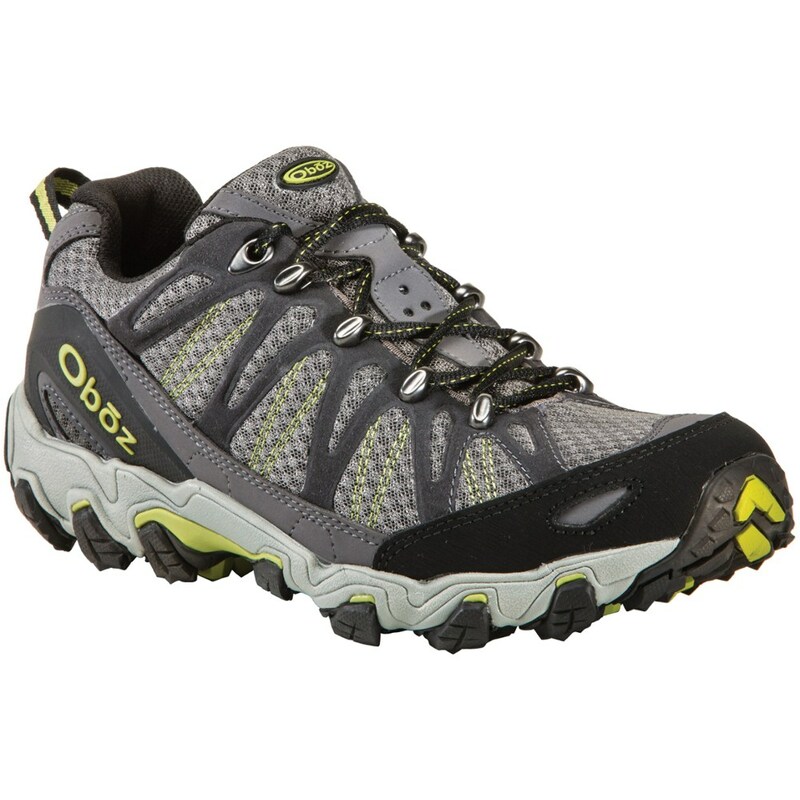 Our iconic waterproof hiking shoe features a new, lighter design for Spring 2013 for hiking maximum miles in minimal time. Dual-density EVA Cradle Guide technology in the midsole enhances impact control during foot strike and provides a stable platform throughout your stride. 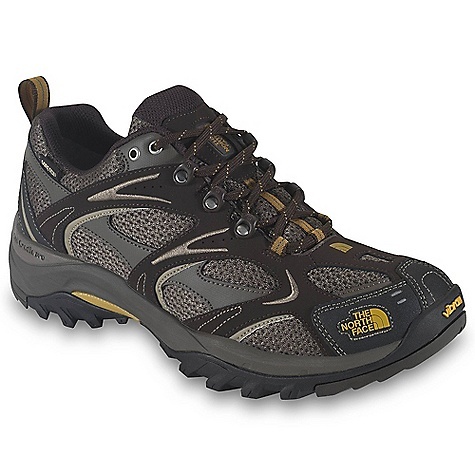 Breathable GORE-TEX liner seals out moisture, allowing you to hike comfortably in wet trail conditions. Snake Plate provides superior underfoot protection for reduced stone bruising without sacrificing flexibility. Lightweight construction features a seamless forefoot and panels of breathable, abrasion-resistant mesh. Grippy Vibram outsole is lightweight, yet durable, and aids with stable footing over wet or dry terrain. On Sale. Free Shipping. The North Face Men's Hedgehog Guide GTX Shoe FEATURES of The North Face Men's Hedgehog Guide GTX Shoe Upper: PU-coated leather toe cap for durability Welded, synthetic-leather forefoot Welded, synthetic, overlay-reinforced midfoot Abrasion-resistant, breathable mesh Gusseted tongue Gore-Tex Extended Comfort Range waterproof, breathable membrane Northotic Pro 2.0 footbed Bottom: Dual-density, molded, EVA Cradle Guide midsole platform TPU shank for lightweight support TPU Snake Plate forefoot protection Exclusive lightweight Vibram rubber outsole SPECIFICATIONS of The North Face Men's Hedgehog Guide GTX Shoe Last: TNF-001 Approx Weight: 1/2 pair: 13.5 oz / 384 g, pair: 1 lb 11 oz / 768 g This product can only be shipped within the United States. Please don't hate us. Dual-density EVA Cradle Guide(TM) technology in the midsole enhances impact control during foot strike and provides a stable platform throughout your stride. 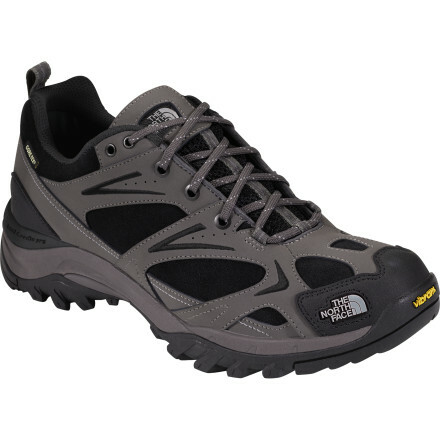 Breathable GORE-TEX(R) liner seals out moisture, allowing you to hike comfortably in wet trail conditions. Snake Plate(TM) provides superior underfoot protection for reduced stone bruising without sacrificing flexibility. 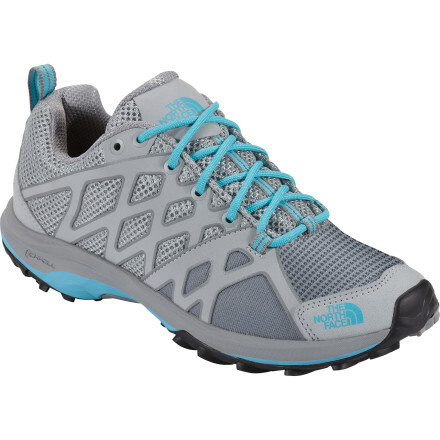 Lightweight construction features a seamless forefoot and panels of breathable, abrasion-resistant mesh. Grippy Vibram(R) outsole is lightweight, yet durable, and aids with stable footing over wet or dry terrain. The North Face Hedgehog Guide GTX is not available from the stores we monitor. It was last seen February 18, 2015	at EMS.